This weekend, we’re building a modified chicken tractor for our laying flock (using an Ussery design with some of our own engineering flair since we don’t use an electric fence for our girls). If you’re interested on more regular updates than Sunday’s wrap up, LIKE us on Facebook (in the sidebar) and follow along! Eagerly awaiting their new home! 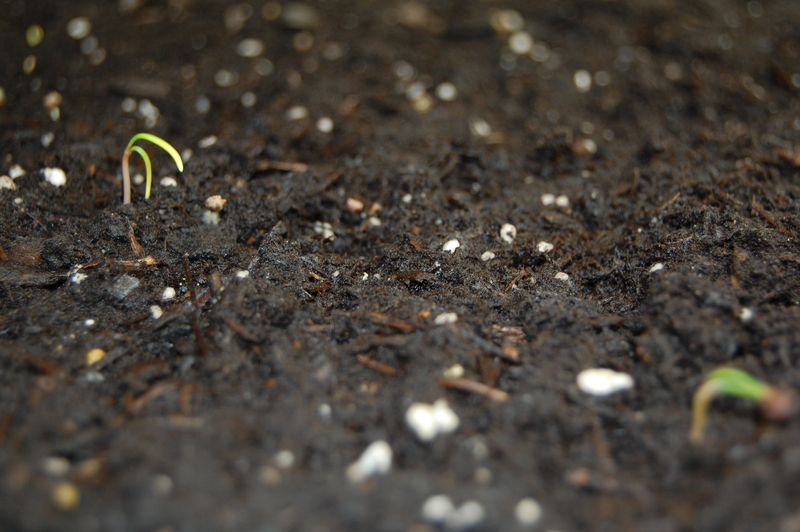 We had our first sprouts appear early this morning. Please forgive the photo quality; I was in a hurry to get to work and wanted to share our little bit of spring with you! Update: While I was at school today, both the basil and lettuce sprouted! From the moment we got engaged, I knew what I wanted for Save the Dates: picnic-y vintage postcards. It didn’t take me long to find an option over at Wedding Paper Divas. Their service was prompt (we had the post cards in hand within a week), and the quality far surpassed what I expected, given the price! The best part about the Divas is their regular sales; we managed to hit one for both the purchase of our Save the Dates and Invitations, saving 10% of the cost and all of the shipping on each order! And our photographer, Jane Mavor, really captured exactly what we were looking for in our images (this is just one of dozens that we love and are so lucky to have!). But when it came to ordering invitations, I dragged my feet. We had about eighteen months, initially, to plan the wedding, and I just couldn’t figure out what I wanted. Our wedding is going to be a backyard affair, full of crazy antiques that we’ve collected or salvaged, mason jars of flowers, bubbles, and …. undoubtedly … chickens. I wanted something whimsical and elegant and… simple. I looked all over before finally settling on another WPD design, Simple Pleasures: Willow. And while the image below shows their details, not ours, our names, address and information filled out the card perfectly. Included in our purchase was a free digital proof, and I was delighted by how easy WPD’s technicians and designers were to work with — they made a fairly significant alteration on both our Save the Dates and invitations. The invitations arrived in about ten days, and the envelopes that came with the invitations without an extra charge were on good quality paper and had a really nice texture to them. My only advice is to double-check with your fiance and families before ordering invitations. We thought we’d finalized our lists, but came a little close in the end, as we remembered a handful of names after the order was placed. Also give yourself plenty of time to address everything. I spent one whole afternoon on return addresses and response card envelopes, then another evening on guest addresses. All in all, with one more step complete, we’re looking forward to the wedding even more! 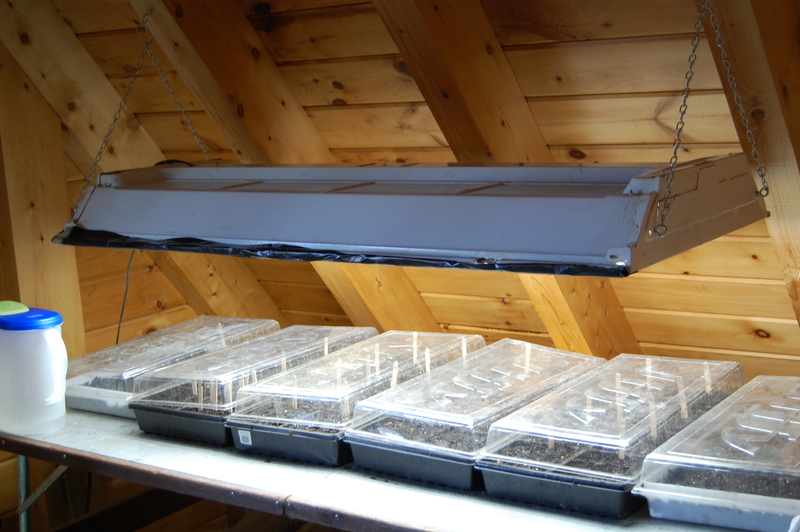 Given that we have about eight weeks before we will be able to safely plant some of our most tender vegetables (tomatoes, peppers, artichokes, basil, etc…), we decided that it was time to take out the grow-light and get everything situated. We use an old metal table (which does a great job reflecting heat back into the plants), a recycled florescent four bulb T8 fixture, and a timer that ensures the plants get a solid 12 hours of light/day. On Saturday morning, we set everything up and refilled the seed starters that we used an saved last year with fresh potting mix. Given that the soil had spent the last few days in our garage, we warmed it under the lights for an hour before planting. Given the outrageous cost of plant markers, I also purchased a box of popsicle sticks (which we can recycle after use) to use as plant markers. Above, each parenthetical corresponds with the popsicle stick plant markers I plan to use. Once done, we gave everyone a nice drink of water, put on the greenhouse caps and turned on the lights. Keep checking back for our weekly plant update! It has been a pretty crazy week up here in the Great White North. Between the warm temperatures (three days of record-breaking 70’s) and a very busy time at work, it’s been all we can do to make sure the animals are fed and household chores are done before we leave for work again. Abby and I have started training for a 5K, using a great Pooch to 5K training program that is now Abby-approved. Honestly, this is the first time I’ve ever gotten her to run on consecutive days without hiding under the bed. 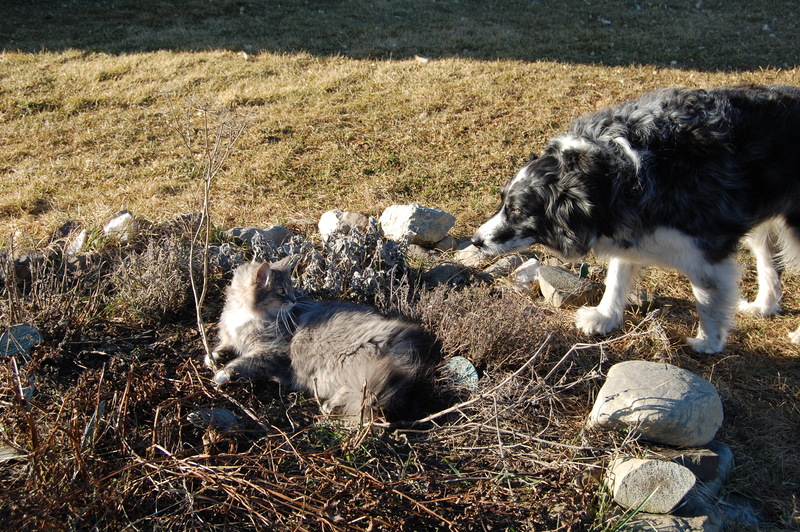 Abby, checking in with Oscar (amid the first sprigs of catnip) after a run. 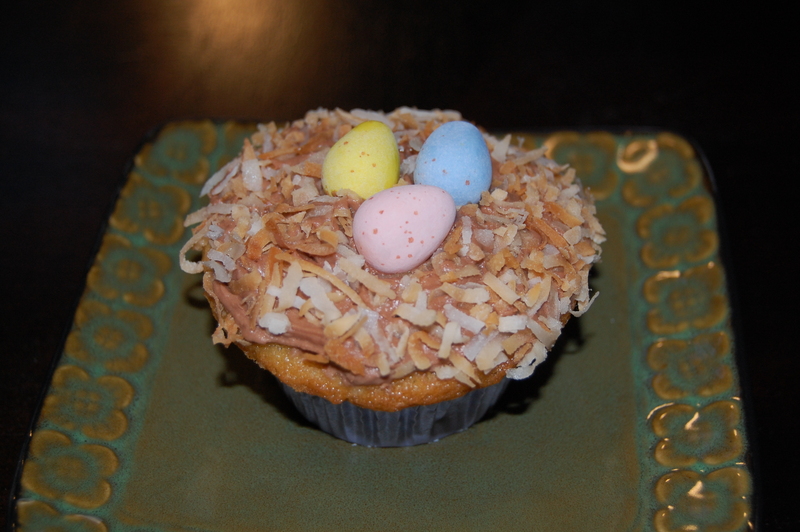 Coconut Cupcakes with Chocolate Butter-Cream Cheese Frosting! At work yesterday, I used the opportunity of a baby shower to test out a cupcake recipe for the wedding and was thrilled to discover that Coconut Cake, a favorite from childhood, is even better in cupcake form (buttery, soft, moist and delicious!). Since it was a baby shower, I decorated the cupcakes like little spring nests since several of our gifts had an owl theme and will include the recipe later this weekend. After work yesterday, I spent some time photographing the happenings with our chickens and in our gardens, so I can have some compelling before & after photos as we prepare for both our sustainability project (maybe this will be the first winter that we don’t have to buy veggies and fruits from the grocery store) and upcoming wedding. Elliot, keeper of the A-Frame flock. 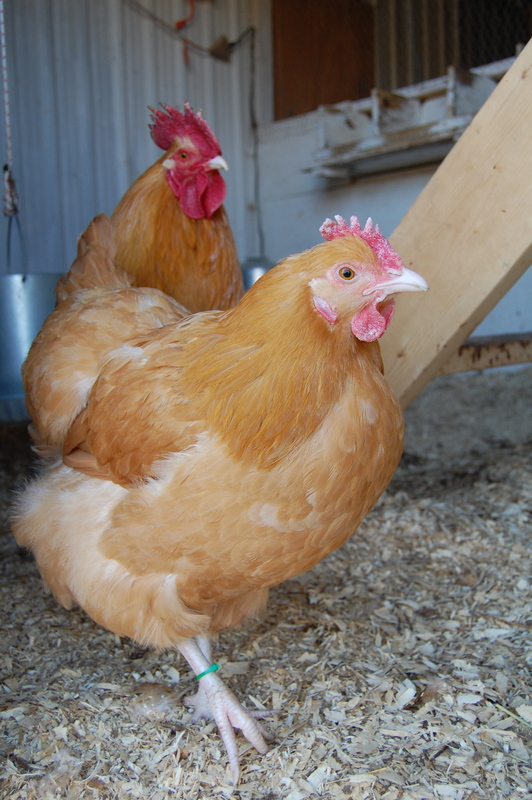 Henrietta, a happy & healthy member of the winter coop flock (with its yet-to-be-named rooster. 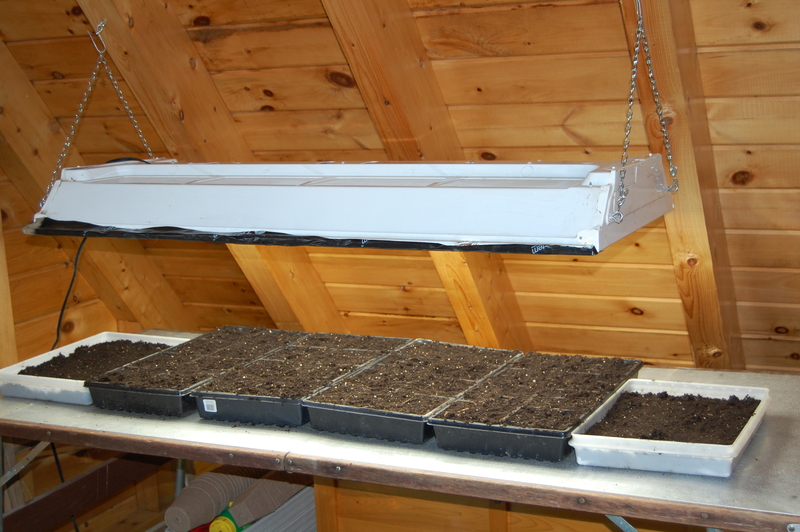 Be sure to check back in tomorrow for a little tutorial on setting up a grow-light for garden plants! We’ll be starting many of our long-season vegetables in preparation for late May, when they can actually go in the ground! Today, partially because of the warm weather and partially because I needed some time with the chickens, I divided our flock: five birds per subgroup (1 rooster and four hens). 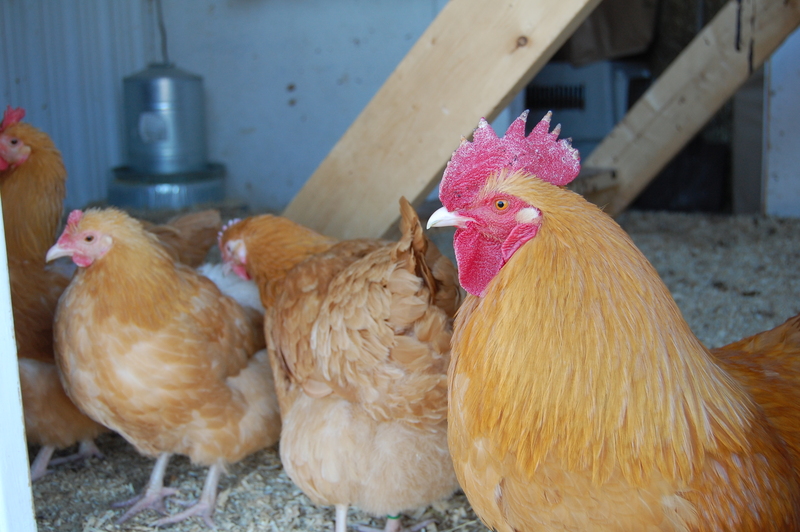 Five remained in the cozy indoor pen and five moved outside to our liberated-from-the-snow A-Frame coop. Those still in the indoor pen got two hours of supervised free ranging this evening, so there was equal jealousy between those who spent the day outside and those who got complete freedom for two hours. In the end, everyone seemed pretty content at slumber-time. Now that everyone has settled in for the night, I’m hoping that the weather holds long enough for us to keep the groups divided so we can track lineage into our next generation. 21 days and then we start working on the spring hatch! More on the move and photos of the accommodations this weekend. 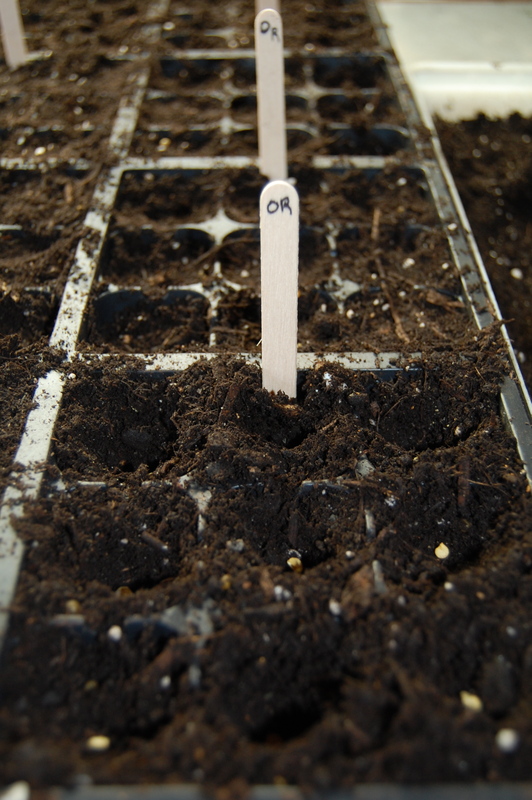 Also coming up this weekend… seed starting! Somehow, it’s Thursday. I’m writing furtively before tackling my pile of grading because it seems like the moment I hit campus, I’m swept under a pile of small but important tasks. To give you just an idea of what’s been going on up north, the temperatures have hit day three of 70+ degrees, and our snow is nearly gone. Since I had Monday and Tuesday off, the girls spent those days basking in the sun and enjoying their gradually expanding yard. I’m trying not to grow attached to the glorious warmth because its March and spring is one of the cruelest seasons; it was snowing last week, it could easily be snowing again next week. We have a list of tasks a mile long, as we prepare for the wedding. On Tuesday, I stained the deck railings (where I’m going to put flower boxes in a few weeks) and painted trim around the doors and windows. 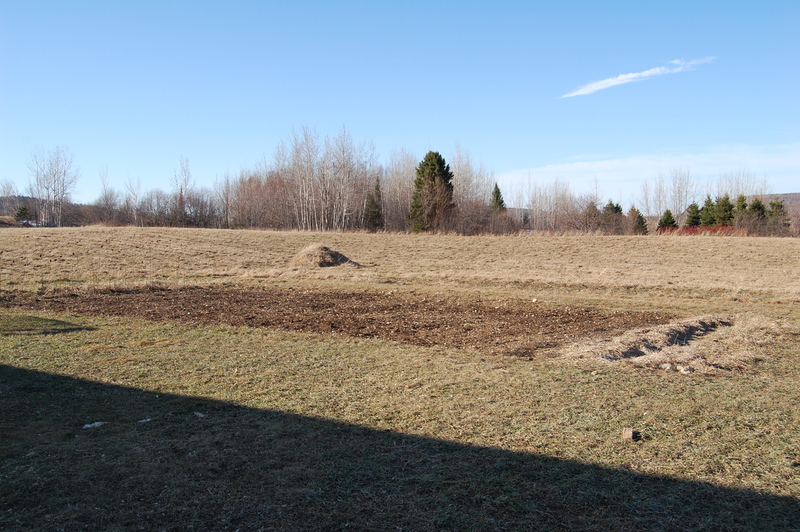 Even though the garden has started to peek out from under the snow, it will be at least two weeks before the soil is workable, so I’m trying to keep busy with other chores. 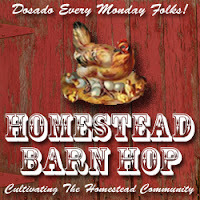 We might even start the new coop this weekend if the weather holds. One problem that I’ve noticed recently is that our egg production has dropped dramatically. After laying like clockwork for six months, the girls just aren’t producing every day (we get two eggs from eight chickens). I’m assuming it has to do with the crazy temperature variations and the changing daylight and hoping that this is just a fallow period before production picks up again this summer. Have you experienced anything like this? Do you have any advice? We just returned from a brief journey south, and with temperatures near sixty (!) yesterday, we elected to spend the day outside with the flock instead of inside with the blog. I’m hoping to have a new post later today then resume regular posting later this week. Has spring sprung early where you are, too? 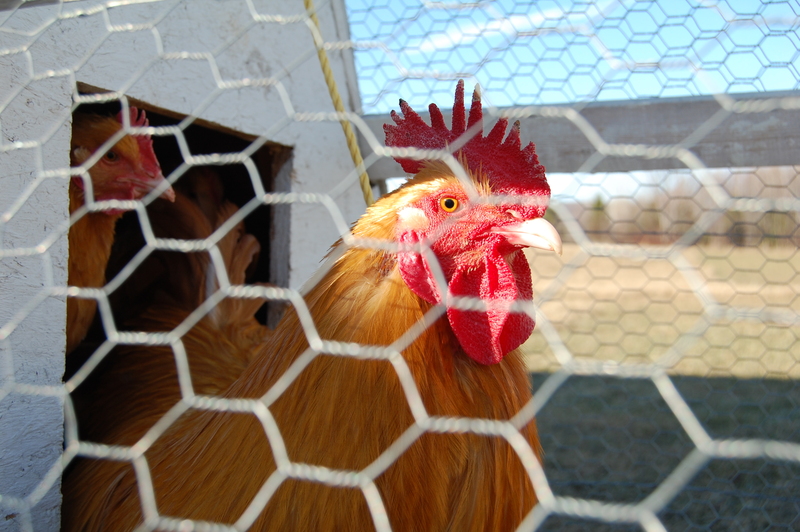 Henrietta: Back to the Flock! This morning, I returned a much improved Henrietta to the flock. I also gave her a bowl of warm water with 2 T of OACV, which went to the flock this morning (and they drank it like it was the greatest thing they had ever encountered). Although the mash clearly wasn’t what she wanted (she’d been clucking over around the cracked corn bin), Henrietta tucked right in, and this morning her crop was empty again. Given that she was behaving normally and seemed really anxious to be alone in the dog crate, I reintegrated her to the flock by letting them all out into my work area where she was already settled in. The hens circled her, clucking and rubbing against her and the roosters, well, we’ll just say the big rooster was happy to see her again and the little rooster got out of her way when she was ready to lead the crop back into the coop (as she is pretty high in the pecking order). I watched the chickens for about ten minutes, while I spread fresh shavings, changed their water and refreshed their food. Henrietta helped herself to some water and nibbled on some of the food before settling herself in among the girls. I think she’s on the mend! I will note that I have marked her with a loose green zip-tie, so I can check on her regularly and easily. The hens have access to layer pellets, but until Henrietta is totally on the mend, there will be no more cracked corn treat before bed in the evening. 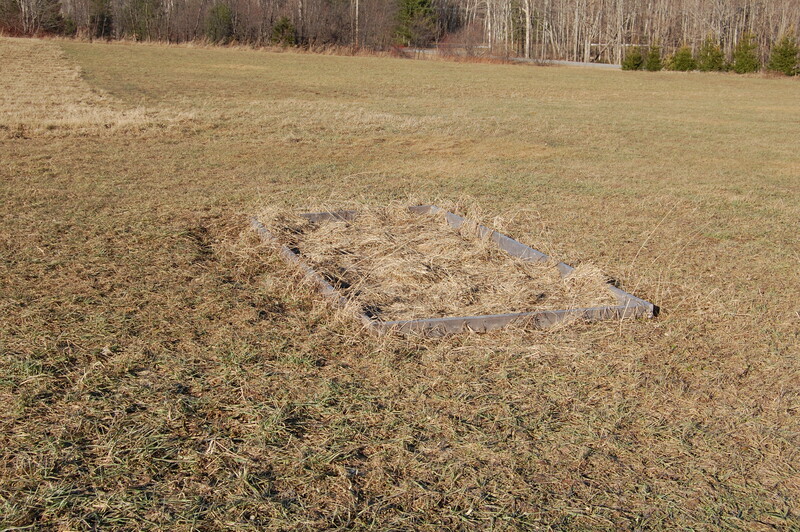 I’m also going to stop throwing down loose hay for the girls to play with, as I think that might have been a mitigating factor in her impacted crop. While I’d never seen them eat it, I just can’t take the risk. I’m also going to be more careful to chop up whatever veggies they get, rather than throwing in larger chunks for them to pick over (they’d received a quartered winter squash only a day or so before the impaction. Thank you for your kind thoughts and comments about Henrietta. I’m certainly happy to see her on the mend. Henrietta’s crop was clear when I got home from work today! More on keeping her healthy tomorrow!